Everything looks fantastic! Well done. Color on the building really does look very good. Shooting in manual mode is a real art, when I was learning about depths of fields and all those fancy things that could be done it was real interesting but like everything if I didn't keep using what I learned I lost it, you look like you have the hang of it. I've been doing some experimenting with chalks and setting them with alcohol, I've been getting some real interesting results. Have you ever tried this? Many thanks for the photos of the other cars in that train. They are all beautiful! And your hardware store is coming along beautifully too. The sepia-toned B&W photo looks very "in period" too. Wow! Enjoy that new camera! In 2008, I began to experiment with a digital SLR camera. And it was the late Mike Chambers here on the forum who encouraged me to buy a piece of software named Adobe Photoshop Lightroom to organize and edit my photos. Mike had been a Beta tester for Lightroom 2. Three cameras and three versions of Lightroom later, I seem to get much more photography accomplished than I do modeling! Much appreciated Carl, Lynn and Stu! Stu, I must mention that the artwork for the coach and the drawing room car was made by John Ott so all the credit for the beautiful artwork should go to him. Photography is another hobby and wouldn't it be great if there were more hours in the day . Thanks for the tip on the program, my pictures today are all unsorted on my computer. Lynn, I'm not that great with cameras but I'm learning. I have also tested using chalks and alcohol on details after watching a Dave Revelia dvd. I also tested it on wood setting it with alcohol. I did that on the weathered wall but I must say that after a lot of drybrushing the effect of the chalks is somewhat diminished but I guess more practice will help. 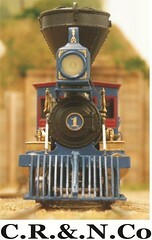 Hakan, that Woodruff sleeper is the best-looking HO scale passenger car I have ever seen. Keep up the great work. Congratulations with a fine camera! Should give us even better images of your fine modeling... your cars are magnificent! Thank you Adrian and Troels! You're words mean a great deal to me. Troels, the Pen was a compromise as the original idea was to get hold of a OM-D as you recommended. But the price difference was huge and I could not find a OM-D for a reasonable price second hand. I guess they are good:-). I compared the OM-D and the Pen-PL5 and they were quite similar in function and Olympus has a drive now with a free lens if you buy of a Pen camera. Thanks for the tip on the program, my pictures today are all unsorted on my computer. H�kan, if you do buy Lightroom 5, do look for a book on the software by either Scott Kelby or Martin Evening. The books are pretty comprehensive. There are a couple of things one should do to unsorted photo files BEFORE installing Lightroom and beginning to build what it calls a "catalog". I got the book I use from either PeachPit or from the Adobe Press. Once you get set up, it's a pretty intuitive, user-friendly program. Thanks for the tip Stu, I'll keep a lookout. I have made a rudimentary interior to the store as the windows are quite large and sometime in the future I'll put lights in my houses. 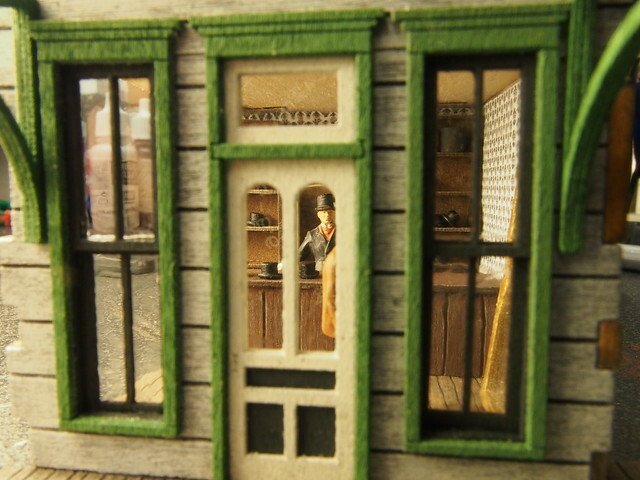 The photos reveal that it is to be a Hat and Tailoring shop. The name of the shop is to be E. Derby Hats & Tailoring and be placed in my future town of Innsmouth. Another fine scene in the making, H��kan. 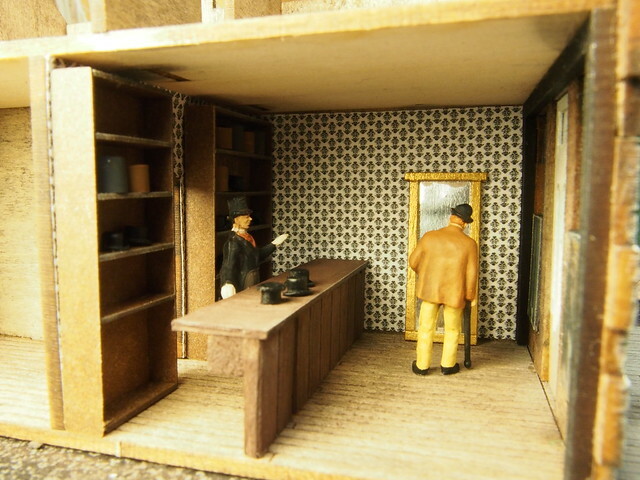 Some O scale interiors are not better than that. Great modelling. Hi H�kan, hat's off to you! For pulling that interior out of you know what! Nothing like a nice shot from the outside in, what would really be different is a shot from the inside out. Thanks Frederic, although a little meager as an interior it was still fun doing. I think it's an interior well done.